Last year's 16s Clay Court champion had all she could handle in Tuesday's third round of the USTA 18s Clay Courts, but No. 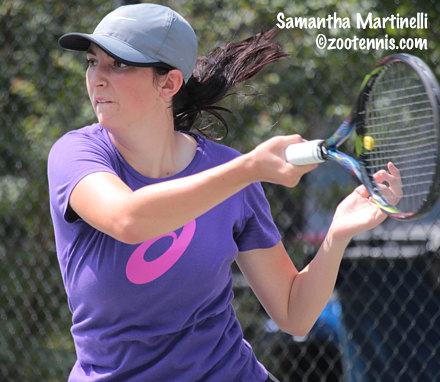 2 seed Samantha Martinelli kept her cool in the oppressive Memphis heat to post a 6-4, 6-7(4), 7-5 win over Sophia Patel. Martinelli had a match point in the second set, and saw two more match points get away in the third set, with the 17-year-old from Las Vegas finally putting away the stubborn Patel on her third attempt to serve out the match. The first set, which was interrupted in the fifth game for over an hour due to lightning in the area, featured only one hold of serve by either player, with Martinelli getting that in the third game. After getting broken in second set to fall behind 2-1, Martinelli won four straight games and served for the match at 5-3, earning a match point at 40-30. Her backhand went long on that point, but a let called, caused by a ball from another court, had broken her concentration. "I hit what I thought was a winner, but they called a let as I hit it," said Martinelli, whose match had a chair umpire, as all matches at the Racquet Club do. "That got to me mentally a little bit; that was tough to bounce back from." Patel won four straight games to serve for the set, but was broken, giving Martinelli another chance to end it in straight sets. Patel played an excellent tiebreaker, however, going up 6-1, and converting on her fourth set point. After the mandatory 10-minute break, Martinelli broke Patel to start the third set and was serving at 4-1 and 5-2. In her second attempt to serve out the match, and her first in third set, Martinelli didn't earn a match point, with Patel hitting a perfect drop shot at 30-40 for the break. Martinelli's second and third match points came in the next game, with Patel going down 15-40 on her serve. Although Patel played impressive defense on both points, Martinelli ended up making forehand errors on both match points and Patel held for 5-4. Martinelli started her third attempt to serve out the match with two double faults, but recovered with two forehand winners for 30-30. She missed a forehand long to give Patel a break point, and a crazy net cord on a desperate defensive lob by Patel dribbled over to make it 5-5. "She definitely didn't let the pressure get to her," said Martinelli. "She played like it was any other score. That's fun to play against, but at the same time, a little frustrating." Unfortunately for Patel, the same problem of holding serve presented itself in the next game, and after coming back from 0-40 to 30-40, Patel could only watch as Martinelli's forehand winner gave her a fourth opportunity to serve out the match. This time Martinelli got first serves in and blasted her forehand for three straight winners, setting up match point No. 4. Another great forehand forced an error from Patel and Martinelli had survived. "I like to pride myself on not changing my game tactics the closer the match gets," Martinelli said. "I want to play as aggressive as I was, I don't want to revert to pushing or anything like that. I just went for my shots in the last game and it worked at the end, at the last minute." Martinelli admitted that although she trains in Las Vegas, the brand of heat she's encountered this week in Memphis, where the temperature peaked at 100 in the mid-afternoon, has been draining. "I'm not used to this kind of humidity and heat, being from Denver," said Martinelli. "I was in Virginia Beach last year, and I don't remember it being like this. This place is crazy." Martinelli was the only Top 4 seed taken to three sets, with No. 1 seed Janice Shin defeating Sasha Cayward 6-1, 6-3 and No. 4 seed Ann Li beating Hada Chang by the same score. No. 3 seed Meible Chi lost the first three games, two of them on her serve, to Emily Zhou, but Chi began to find her range midway through the first set to post a 7-5, 6-0 victory. Two No. 5 seeds were eliminated in Tuesday's third round. 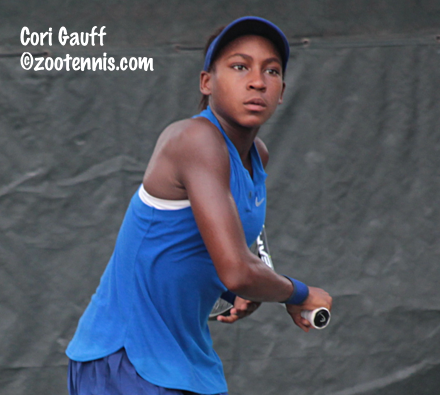 Alyvia Jones was beaten by Nina Sorkin 6-0, 6-2 and 12-year-old Cori (Coco) Gauff defeated Cameron Corse by the same score. Gauff, who finished third at the Southern Closed 18s last month, knows she's in a unique position now. "It's fun playing up, because there's no pressure," said Gauff, who trains at ProWorld Tennis Academy in Delray Beach. "I try to take the advantage. I also get to meet other girls who are going to college or wanting to go pro." Against Corse, Gauff lost only six points in the first set, with Corse struggling with double faults throughout the match. "She was having trouble with her serve, which I was surprised about," said Gauff, who will not be able to play ITF junior events until next March, when she turns 13. "When I watched her match yesterday, her serve seemed pretty good, she had a nice kick serve and when she made it in, it was tough to get it back because it would bounce so high. She was a good player, but I don't think today was one of her best days." Gauff said she has been growing, with her current height 5-feet-6-and-half inches, and has been fortunate not to be suffering any issues from that. "I got taller, so I'm not the shortest anymore," Gauff said. "Most people have pain in the knees, but I haven't any pain. The footwork, it's been tough to adjust, but my coaches at ProWorld have been helping me and it's gotten a lot better." One No. 9 seed, McCartney Kessler, lost today, with Mimi Levine recording a 6-4, 7-6(3) victory. Levine is one of four unseeded players remaining in that eighth of the draw, with Sorkin, Alycia Parks and Nicole Conard the others. There were no doubles matches played today, with the round of 16 scheduled for Wednesday evening. For all results, see the TennisLink site. Is there any prior history of a 12-year old reaching the QFs or better at a national 18-Under tourney?